UPDATE 2035 GMT: The UN Security Council will discuss the Israel-Hezbollah conflict at 4 p.m., New York time (2100 GMT). UPDATE 1935 GMT: The two slain Israeli soldiers have been identified as Staff Sergeant Dor Nini, 20, and Major Yochai Kalangel, 25. Both will be buried on Thursday. The UN peacekeeper killed by Israeli shelling has been named as Corporal Francisco Javier Soria Toledo, 36. He was on his second tour with the UN Interim Force in Lebanon. UPDATE 1435 GMT: The Israeli casualty figures have been updated to two killed — a company commander and an infantryman — and seven wounded. Five of the wounded have “light” injuries and two have “moderate” wounds from Hezbollah’s attack with Russian-made Kornet anti-tank missiles. 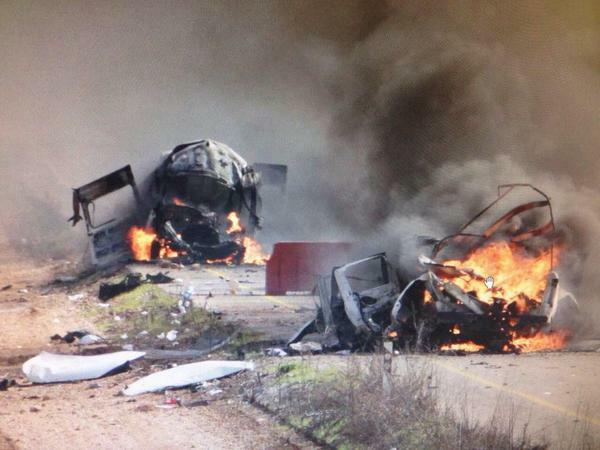 Confirmed: Two IDF soldiers were killed and an additional seven were wounded in the Hezbollah attack near Mt. Dov earlier today. One of the Israeli soldiers in the convoy, speaking to his father, said when the first vehicle was hit by a missile, the highest-ranking soldier on another vehicle immediately told troops to evacuate. The jeep was hit by a second missile seconds afterwards. UPDATE 1325 GMT: The Israeli Defense Forces have updated the number of injured soldiers to seven. Six have “light to moderate” wounds, while the condition of the 7th was not given. UPDATE 1155 GMT: A spokesman for the UN peacekeeping forces says a Spanish soldier has been killed in the exchange of fire in the Hezbollah-Israel fighting. Hezbollah’s Al-Manar reported earlier that the soldier was injured during Israeli shelling in response to Hezbollah’s attack on an Israeli patrol and mortar fire. The Lebanese organization Hezbollah hit an Israeli army vehicle with an anti-tank missile on Wednesday, injuring at least four soldiers. The attack was carried out on a convoy of nine military vehicles in the Shebaa Farms area at the intersection of the Lebanon-Syria border and the Israeli-occupied Golan Heights. Hezbollah then fired mortar shells on Israeli positions for more than an hour, including upon nearby Mount Hermon. One of the mortars set alight a house in Ghajar, a village which straddles the border. Israeli forces responded with about 50 artillery shells into Lebanon. Hezbollah’s Al-Manar TV said a UN peacekeeper from Spain was injured. The Israeli army would not confirm the number of its casualties, but said that no soldiers in the patrol had been kidnapped, countering a claim by Hezbollah. Hezbollah’s attack is in retaliation for an Israeli airstrike on January 18 that killed Hezbollah and Iranian commanders and personnel. On Tuesday, two rockets were fired from inside Syria towards the Israeli-occupied area of the Golan Heights. Israeli forces responded with about 20 artillery shells. The Israel Defense Forces Chief of Staff, Benny Gantz, is holding high-level consultations over a further response. Prime Minister Benjamin Netanyahu cut short a tour of the Gaza Strip border region and is going to the military headquarters in Tel Aviv to join the meeting.